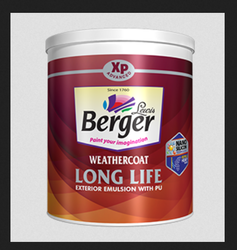 Hardware & Bathware Wholesale - Authorized Wholesale Dealer of berger exterior emulsionsweather coat long life paints, berger exterior emulsions weathercoat all guard paints & bathroom showers in New Delhi, Delhi. Has a 10 Year Performance warranty. Nano Silicon technology provides protection against extreme rain. 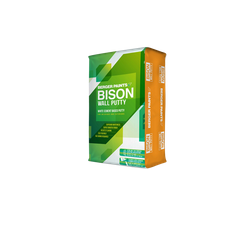 Prevents fungal and algal growth on exterior walls and is ideal for heavy rainfall areas. 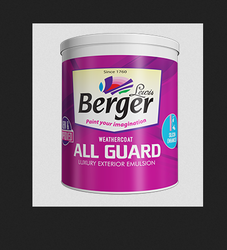 Has a unique polymer composition to remove dust and keep your home looking fresh for years to come. PU provides a superior sheen finish. Make your house the talk of the town. Shades that last for more than 10 years, making your house look new, year after year. Excellent film integrity which provides unmatched performance - 7 Year performance warranty. Silicon additives provides excellent water repellence and protection against rain. Unique polymer composition that prevents dust settle on exterior walls and keeps your walls looking fresh for years to come. No Dust settlement on the walls result in no black streak marks after rain. High sheen finish making your home the pride of the neighborhood.